Adults: Take 10 drops with water, 3 to 5 times daily. Insalivate before swallowing. Duration of use: Consult a healthcare practitioner for a prolonged use. 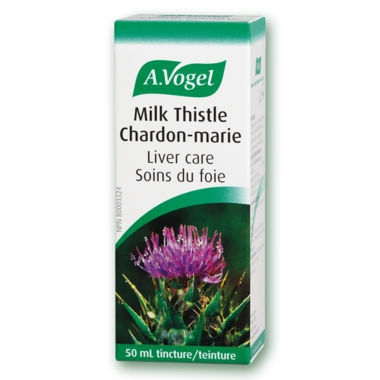 Milk Thistle (Silybum marianum) fruit (1:2) …923 mg, equivalent to 461 mg fruit. Daily dose (30 drops) contains 839 mg of Milk Thistle tincture. Non-medicinal ingredient: 1 mL of tincture contains 0.61 mL alcohol (ethanol). In case of impaired liver function, seek medical advice prior to use. Do not use during pregnancy or nursing without medical advice.